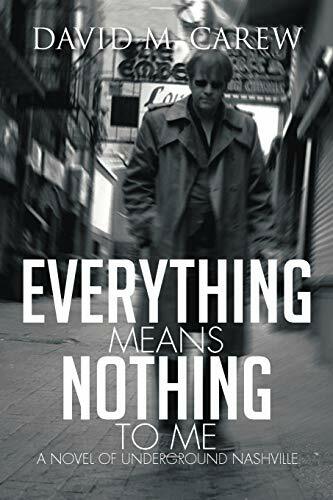 In the tradition of Hermann Hesse and Charles Bukowski, David M. Carew writes dark, searing novels set in the "underground" of a great American city-Nashville. Carew's 2001 debut, Voice from the Gutter, was hailed "a minor masterpiece . . . an existential novel you will not soon forget" by Tennessean book reviewer Roy E. Perry. Now Carew returns with an impassioned new tale of love, loss, betrayal, and redemption. When the sad, lonely, half-mad writer John Werrick meets mysterious singer/songwriter Eva Downing in a Nashville club, it sparks a tragic, haunted love. Fascinated by Eva, Werrick burns to answer the riddles surrounding her: Why does she so passionately yearn to perform -then make sure few know about it? Why does she go through a strange, dark ritual before performing? What is the explosive secret she is hiding? As Werrick struggles to unravel the mystery, he discovers the brutal secret shrouding Eva's life-as events surge to a shattering climax. David Carew was a candidate for the U.S. Congress in 2000. A novelist, poet, songwriter, and freelance journalist, David for two years wrote the popular "Small Business" column for the Nashville weekly In Review, and also has published feature articles in Bookstore Journal, Business Nashville magazine, and Inside Music. Before moving to Nashville from New England in the early 1980s, he published two short stories and three poems in the New England magazine Bitter Sweet. He is employed as a direct-mail copywriter and publicist at a publishing house in the Nashville area.